A few months ago I got to work with the wonderful people at Elmer’s and throw a craft party! We had a BLAST! Then last month they invited me to participate in a “look for less” challenge. I was so excited, I had a hard time narrowing down the “look” I wanted to create my own version of. But I finally found something (on Pinterest of course). I fell in LOVE with these pieces by Valerie Boy (as seen on Apartment Therapy). My version… and Valerie-Boy’s. 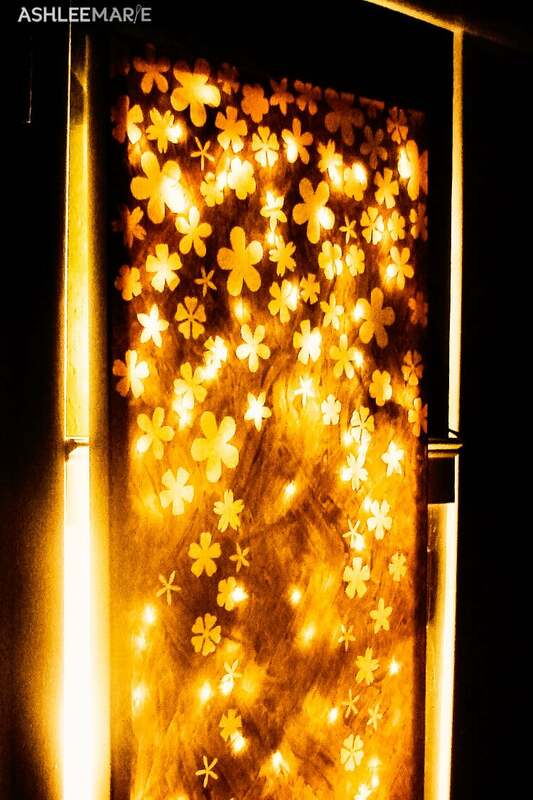 Her’s is made of powdered metal cut and bent, mine is Canvas, paint and lights! Her’s cost an arm and a leg (and a first born) and mine was a grand total of $25! 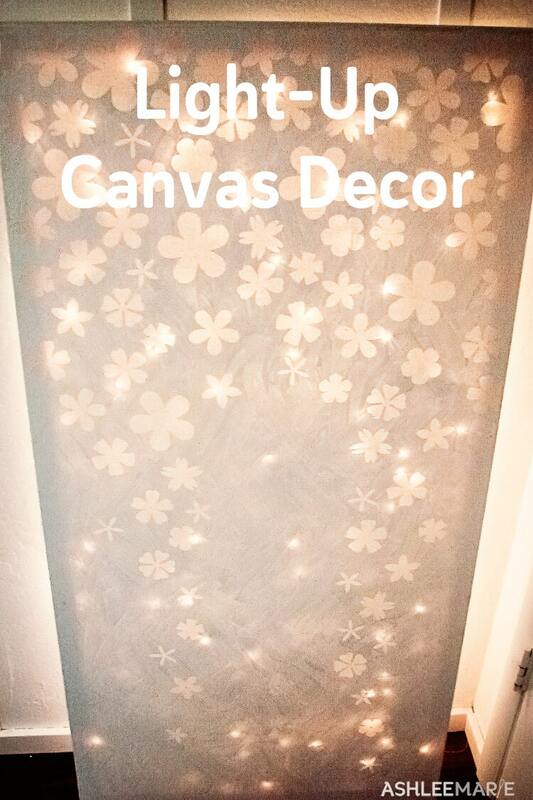 I had a weird wall space I wanted to cover so I went with a long and narrow canvas that I picked using a 50% off coupon! This is 24″ x 48″ that I got for $25 (the only thing I had to pay for!)! The perfect size for my project. Next I used the X-ACTO Designer Series Gripster Knife and cut flowers out of black cardstock that I had on hand (so I could see it through the paint), then using CraftBond Repositionable Glue Stick I stuck, (and removed and re-stuck until I like the placement) the flowers onto the canvas! AWESOME, I am already in love! Next I used some thick Acrylic paint all over the front, in 2 coats. I used big strokes going for a thick chunky look. But you could paint it on pretty smooth if you wanted. I kind of wish I’d gone for 3 coats, but I wanted to peel off the flowers while it was still wet, and before they were stuck on for good. Next, obviously, I peeled up the black paper. There was something very satisfying about peeling it all up! I let it dry overnight! I was planning on using a fancy expensive light to light up the back, but then I laid eyes on my icicle lights (in a pile of throw away- no more icicle lights for me- what were we ever thinking? So messy looking). Anyway I used some nails to attach the lights (I nailed them half way in then bent them over the lights) in a criss-cross pattern to cover the whole back. Ashlee, that is gorgeous! I want to make one now (um, after Christmas)! Thanks so much!!! Can’t wait to see what you make! sorry, I have no interest in making and selling items. Just sharing how I did it so others can do it! I’m very flattered though! Hey Ashley guess I just left some comment in the wrong place .. But my question is the lights.. Do they need to be plugged in the socket all the time or how you managed it? Wow… Seriously. Thanks for sharing this. I might have to this, like right now. Thanks so much! Don’t forget to come back and show me what you did with it! This is so amazing….I have GOT to try this!!! I found you on somewhat simple’s party. Thanks so much for sharing! Thank you so much!!! link back up if you do it! I’d love to see what you come up with! Oh wow!!! This is so pretty!!! Amazing!!! Thanks so much! It was really fun to make, and I’m super happy with how it turned out! I love this Ashlee! Thanks for linking to the party! I’m featuring this on my blog today! Hi! I LOVE this! I will defenitely have to try it! Thanks so much! Come bake and link up if you end up making it! I’d love to see what else people come up with! Wow, you made something look so easy to make! I think I’ll follow your steps and create one myself. I think this would even be a nice dining room accent. Thanks! I really was easy, I hope you make it and love it! I’m soooo excited to try this. 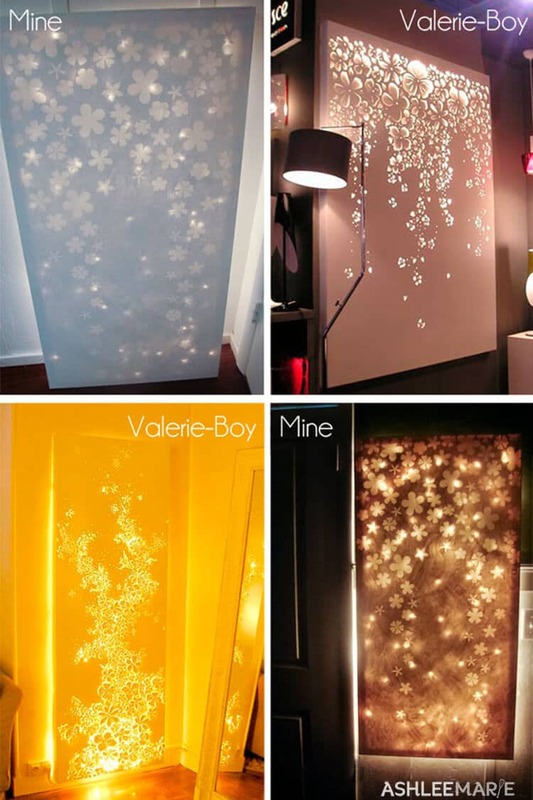 I want to put in my bedroom. Thanks for sharing! That’s GREAT!! Send pictures when you do! I love seeing what other people create from my stuff! Agree! We leave it on in the hall all the time and the kids no longer need the bathroom light on all night! Money saver for SURE! Probably a strange question, but..can you paint the canvas a darker color like a blue? I want something with color in my dinning room. Thanks for such simple instructions. Yes of course! Any color with work, but the blank area where the vinyl flower was will be canvas color, so it won’t quite be the same effect. It’s white! it’s hard to do indoor lighting well with a point and shoot, I should retake them with my new camera and see if I can’t get better images! on a frame from michaels. Just the white ones they have there, It never occurred to me that there might be anything special about them or I would have written down more info, I’m so sorry and I hope that helps! I’d like it if it were more opaque. I was thinking that would happen if you gessoed it, but maybe gesso dries too fast, and you really should cover it with acrylic after, (otherwise it gets dirty easily, and is not cleanable) so you’d def have to wait til it dried. I read a Pinterest link to make your own chalkboard paint. That would probably be pretty opaque, but I don’t know how fast it dries. You have to add “unsanded grout” to acrylic paint. I wanted it to be opaque, but it didn’t work out, I wanted lots of texture, and homemade chalkboard paint is pretty runny still (I’ve worked with it a lot). I should have just done another layer, and I’m actually switching out the christmas lights (that I had on hand) for 2 lights I’m going to attach at the top and bottom so it’s just a glow behind it, rather than the spots of light. A criatividade é algo q surpreende e me deixa admirada com a capacidade de pessoas como vc. ótimo.Amei,Adorei fiquei de boca aberta.Mais um vez Parabéns q esta capacidade de criar,de modificar cresça a cada dia. Can you give us a more detailed tutorial?that would be great thanks! ummmm more detailed than the step by step I already posted? i’m not sure what your looking for. is there a specific part your having a hard time with? Muito lindo seu trabalho, uma novidade para mim!! estava mesmo querendo fazer algo novo para minha casa e talvez ganhar algum dinheiro com um trabalho tão diferente, gostaria que você me enviasse mais idéias que você criou. Sou Brasileira e não sei Inglês, espero que você entenda o meu pedido!! Parabéns !! !muito lindos e fáceis de realizar!! espero que compartilhe de mais idéias comigo!! Thank you so much! I’m so glad you like my project, as for sending you more ideas feel free to browse my blog, and subscribe to the emails to get updates every time I post! no I’m sorry, you just buy a canvas, stick vinyl or stickers on it, paint over it, peel up the stickers and back light. It would be a pretty boring video! Yes, ummm actually it’s so simple an idea but it’s so beautiful .. I wanna try it for two weird boards the end of the staircase in my house.. Thank you so much for so much detail about your project. Hey Ashlee that is amazing! I’m hoping over this spring break i can make this to put in my dorm. I was wondering could I do this same project with a colored canvas? I wasn’t sure how that would effect the lighting of it. Thanks so much! you totally could, this light doesn’t actually give off light, just a glow. so the glow would be a bit different! I think that would look AMAZING! Ummm this was just a plain white really thick artist acrylic paint! I’m definitely going to try this! But how did you hide the cord from the lights? I have the board and batten and I just stapled the cord into the crack going down the wall to the first doorway and wrapped it into that room and plugged it in. Not ideal, but works in my space. If I didn’t have kids I would have done a bigger canvas and had it on the floor leaning against the wall so the plug would be completely hidden. You clever,clever girl…can’t wait to have a go myself, thank you for the inspiration, huge hug. awwww thanks! I debate cutting around the petal edges every few days, but still haven’t done it! I sooooo love this idea. So just to confirm if I buy colored flower stickers being that its the only ones I can find, then I just paint white acrylic paint over top of the stickers then peel the tickers off? I’m going to make one tomorrow so I just want to make sure I’m doing process correct. And I just use the acrylic paint over the stickers or do I paint the entire canvas? The canvas I’m purchasing is already white. Thank you in advance and once again amazing job and thank you for sharing!! I used vinyl because I could cut out the shapes I wanted. As for stickers, it all depends on how sticky it is. If they don’t stick well enough you’ll have troubles. I put the stickers on first, then paint over them. I’ve been looking for a tutorial for the same light fixture/artwork – THANK YOU! 2 questions – you said you were going to get 2 lights vs. the string lights – did you ever find something that worked for you? 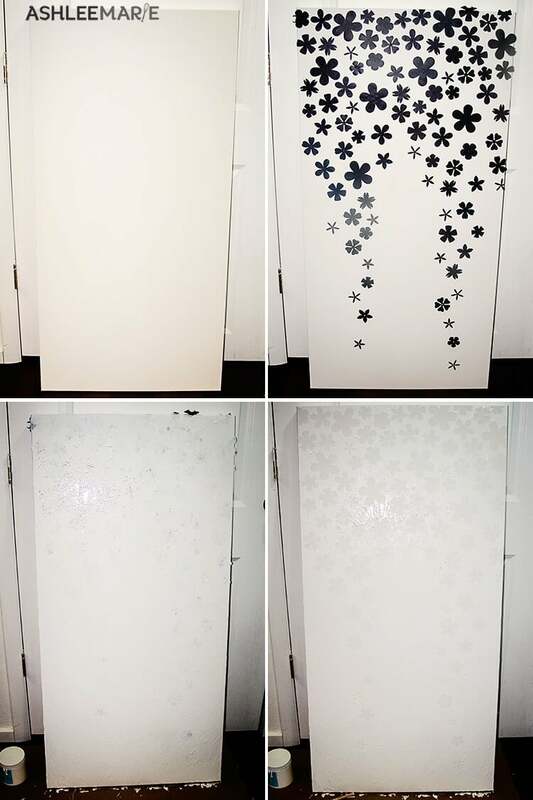 # 2- do you have to worry about paint peeling up when you take off the stickers? What to do there? I never did, still meaning too! I took off the stickers while the paint was still wet so no peeling. OMG this is amazing! I paint so I always have canvases at home. This will be perfect in my girls room. You are one talented lady! Thanks! I wonder if cutting the outer edge of each petal to let more light through would work, or would it stretch the canvas badly? hello – I love this idea and want to put one in my massage treatment rooms. I have two outlets to use and cover. Thinking about doing a 5 foot by 3 foot artpiece. My question is this: How did you figure out the on/off switch? The on/off switch in my room works the overhead florescent, I need a toggle switch. Do you have a toggle switch in any of these, and if so, how did you do that without it showing? Please let me know. Very interested!! Thank you. I didn’t, I just plugged it in and unplugged it when I wanted it off. Sorry, not quite that fancy! 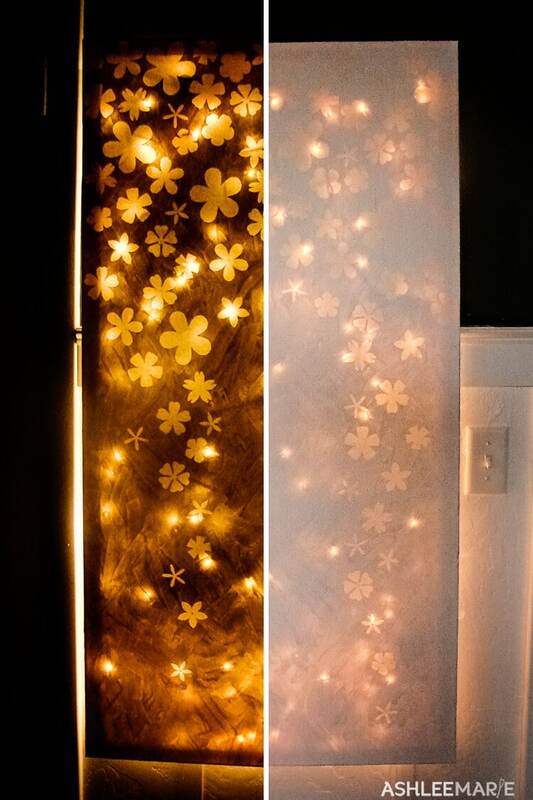 This is gorgeous… In a later comment you stated you were switching out the Christmas lights for 2 Lights for a glow?? What two lights?? I would like to purchase them?? You are amazing by the way! Thank you so much for sharing this! you are so welcome! Have fun making one!!! There are so many possibilities! I saw your version on Pinterest and I have already bought the canvas! I want to make it a light purple, a Lilac color. Do you think that would work? I love yours! Beautifully done! I am going to make one as a headboard for my bed, Thank you so much for sharing!! OHHHHHH i bet that will look AMAZING! tag me in social media if you share it! Hey there… seeing your beautiful piece, and reading thru earlier comments and ideas, has me swooning and thinking of all the possibilities for my home. 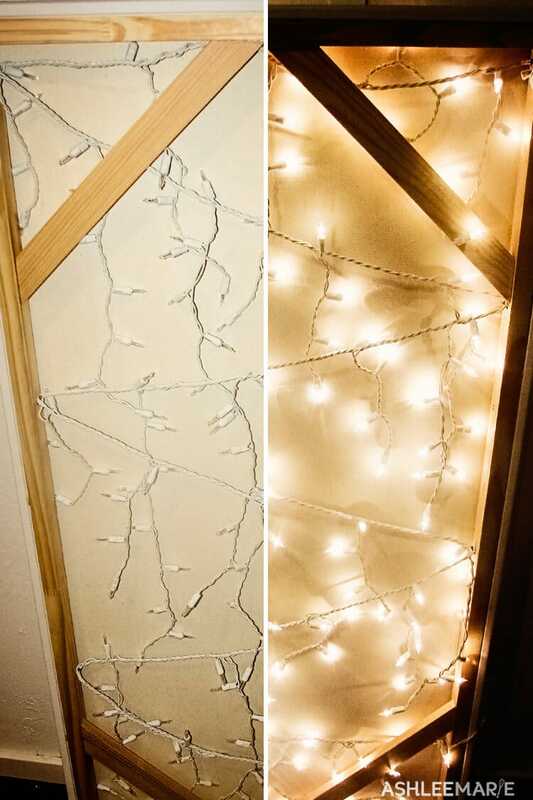 I saw another Pinteresting idea… working from the backside of an empty frame, attach random twigs/branches across the bottom of frame, then run string lights up and down the frame. Cool eh? Thanks so much for sharing and providing an oh-so-simple step-by-step. I’m so excited to try this project! PS… I like the idea of cutting just a sliver of canvas on the upper and lower edge of random (not all) flowers. I’m sure you’ll agree a test on a smaller canvas is wise. ?